The flu has been officially kicked out of our house, thank goodness. The Skeptic got a little sick and the boys were amazingly flu-free. So I can actually bring you a real post today! I present to you my Loop batt, all spun up and ready to go. 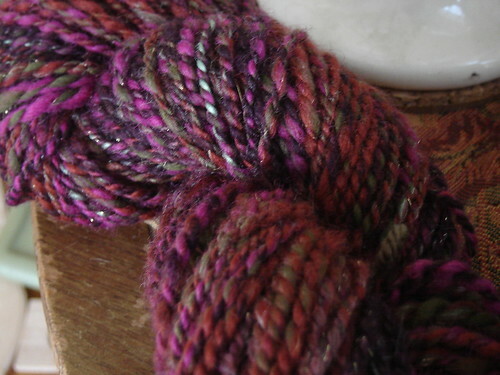 Earth Goddess is the colorway. I really struggle with getting a good picture taken while the boys are around. Knittybaby dumped a bag of chips all over the carpet while this second one was being taken. Not helpful when you’re trying to take an in-focus picture without the flash. I’m pretty happy with how this yarn turned out. 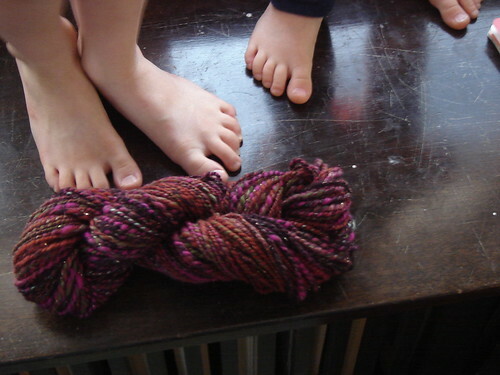 It’s about a heavy worsted for the most part, with the occasional thick spot. But better consistency than I’ve had before and the batt was fun to spin. Tomorrow is March first, which starts a fun but busy two months for us. All four of us will have our birthdays to celebrate, which means it will be contest time soon, so keep your eyes open! Enjoy a wonderful weekend everyone. I’m getting in the mood for spring, so I’m looking forward to some warms temps here in Minnesota. Martha’s gardening issue has me inspired….